A very special, very strong, determined and wonderful client has given me permission to share her story here. After a homebirth first time round, she had implicit faith in her body’s ability to grow and birth her babies in a very ordinary, normal way. It took us a while to get our equally trusting, supportive team together for a planned hospital birth, but we got there – and this is how it went. Much love and thanks to you, Super-Twin-Mum – I know your story will be an inspiration and an education to my readers. I went into labour at 38+4 (to consternation of doc who wanted to induce at 38w but agreed to wait until 39w). They faffed around for a couple of hours on my arrival deciding whether to treat possible strep infection (they did). Then they wanted me to wait for a doc to scan me and check the babies’ positions. This was a crucial point, when my doula reminded me I had a choice to go to the bath now, or wait. I got in the bath, fantastic! Intermittent monitoring throughout. MW asked me to get out when my breathing changed, doc came to scan me and both babies were head down, a surprise as twin 2 had been transverse/breech for weeks. I think he turned on the way back from bath, as things felt very strange and the heartbeat moved from high up to low on my bump. Waiting for the scan proved to be the best decision I could have made. Then they asked me to kneel on the bed, started continuous monitoring. The shift change was coming up, and they wanted to see where I was up to, so I agreed to another VE, and the MW was surprised I was only 7cm (having been 6cm on arrival). They offered ARM, which I accepted, because I didn’t want docs brought in. I do wonder what would have happened if I’d said “wait and see”, but the ARM tipped me into transition just about immediately. I got the “dream team” of midwives at the shift change, (both v experienced), possibly because I was so obviously in transition, and had been a bit of a pain in the arse arranging my birth plan in advance. I started demanding an epidural. The mw explained I would need to lie down for 30 mins monitoring. I said “oh I can’t do that” and started pushing. Twin 1 arrived 13 minutes later (back to back), contractions paused briefly for me to say hello, and twin 2 arrived in 3 pushes 6 minutes later. No syntocinon till after he was born (docs had really wanted it to start immediately after arrival of twin 1, but I negotiated a 15 minutes window). Babies were born about 7 hours after arrival and we were home 8 hours after that. Apparently there were obstetricians and paeds knocking at the door, but the midwife told them to go away. To some extent I was lucky though, not sure how things would have gone if twin 2 had stayed transverse, as the birth plan stated that the mw would have called the docs then. As it was, it was great to be in the care of confident caring midwives and supported by my wonderful partner and an experienced and confident doula.. The euphoria of the birth carried me through for several weeks. I wish I could thank them more. And this also shows it’s never too late for twin 2 to turn. 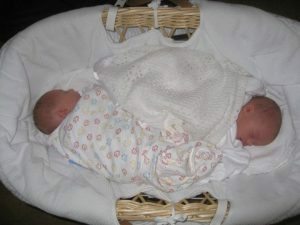 Lovely story – takes me back to my twins’ birth! How wonderful… the first sentence made me smile because I am another mum of twins who had to negotiate not to be induced at 38 weeks. Sadly was induced at 39+4, and didn’t have the great experience that this mum had… so was really pleased to read that it can be done (I knew it could! ).